Welcome to the Monterey Stage Coach Lodge in the beautiful Monterey, California. Located in the heart of Monterey, right off of scenic Highway 1, the hotel offers the casual or business traveler the convenience of easy access to all of Monterey Peninsula's golf courses, restaurants, major attractions, and special event locations. Above all, the hotel is very close to historic downtown Monterey, Lake El Estero, Del Monte Beach, and Dennis the Menace Park. Experience our stylish accommodations in Monterey that provide ultimate comfort and relaxation. 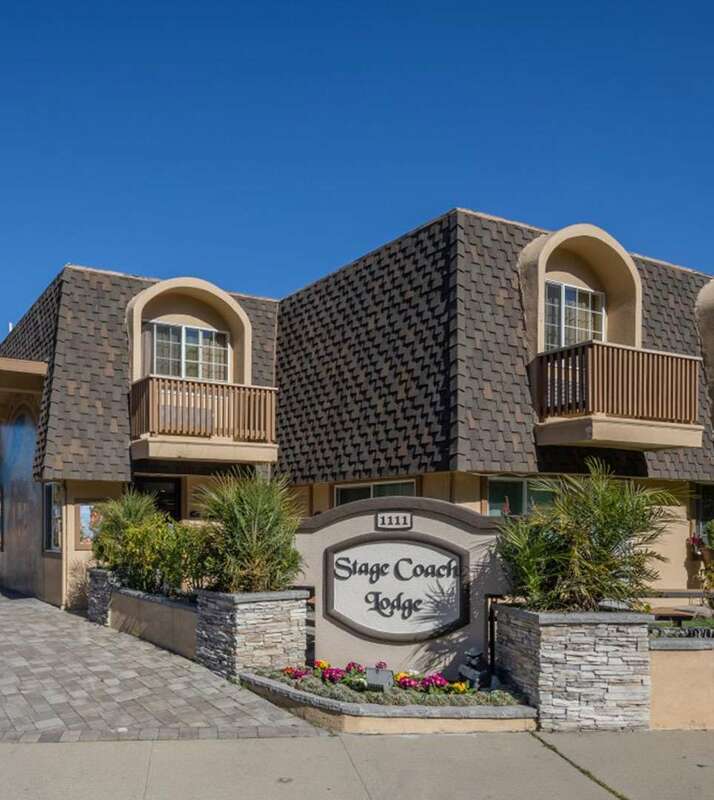 The Stage Coach Lodge is a 25 unit boutique lodge located in Monterey and conveniently situated nearby the cities of Seaside and Carmel. The Monterey Stage Coach Lodge offers guests with a dazzling selection of guestrooms and suites featuring several amenities that are sure to meet your needs. Here at our hotel, you’ll enjoy your choice of beautifully appointed, comfortable guest rooms or spacious suites, all with free Wi-Fi and 42” HD TVs with premium cable. Guest rooms feature one king standard, two double standard, or two queen beds with microwaves and mini-refrigerators, air-conditioning, Keurig coffeemaker, high-speed wireless internet, free local calls, in-room safe, iron & ironing boards and modern granite bathrooms with full baths and hair dryers. Each hotel room is newly redesigned and appointed with modern touches and amenities. Offering an outdoor swimming pool, majestic landscape, laundry facility and a diver’s wash station and a patio for relaxing and enjoying an afternoon. Start every day with our free continental breakfast featuring cereals, juice, coffee, and more. Ideal for leisure and business travel, the Monterey Stage Coach Lodge offers uniquely allotted guest rooms, including some Grand Rooms, host to many corporate meetings, family reunions, conferences, weddings, reunions, and important events. The Monterey Peninsula is a perfect place for a romantic weekend or exciting adventure and is located on the central California coast. We’re within easy traveling distance to most of the downtown’s major attractions, including 17 Mile Drive, Spyglass Golf Courses and magnificent views of the Pacific Ocean. The Peninsula is one of the most attractive and striking areas of the world offering great breathtaking views of natural beauty. The Monterey Stage Coach Lodge is the leading collection of boutique style hotels in Monterey. Most of the nearby major attractions include Fisherman’s Wharf, Pacific Grove, Cannery Row,Monterey Bay Aquarium, Laguna Seca Raceway, the Monterey Fairgrounds, Carmel and the 17 Mile Drive, Lake El Estero, luxury restaurants, Dennis the Menace Park, Pebble Beach, historic old adobes, whale watching, Pebble Beach golf courses and more. The Monterey Stage Coach Lodge welcomes you to amazing views, beautiful beaches and golf courses, and a variety of award-winning restaurants in Monterey and the surrounding areas of Seaside and Carmel. Unfortunately, Stage Coach Lodge is a very busy hotel and early check-ins will probably not be possible. Do message us directly if you would like to see if your room is ready before our posted check in time, and our staff will do its best to get you checked in early. Stage Coach Lodge is a very busy hotel and therefore may not be able to accommodate extended late check outs. If you would like to check out late, you can inquire with the front desk and if there are no incoming reservations, our staff will potentially arrange a limited additional time or help you extend your stay for a fee. The Stage Coach Lodge has a unique garden and amazingly groomed landscaping throughout. The Hotel is 100% NON-SMOKING. The Stage Coach Lodge features handicap accessible parking and a guest room with ADA accessibility features including a shower, grab bars, and other conveniences. Please inquire for any assistance or if you have questions regarding our property's accessibility features. Our front desk lobby is located on the ground floor as are our main amenities such as our patio, laundry room, vending room and our pool offers an ADA pool lift. Let the staff at The Stage Coach be your host. We can help you book events, purchase tickets to local attractions such as the Monterey Bay Aquarium. The Stage Coach Lodge also offers a unique hotel amenity: A full Diver's Quarter wash station to clean off your scuba equipment and shower after diving off the Monterey Coast. Guest Parking is FREE and ample in our safe and secure private parking lot. We do have overflow parking on the street. We have FREE wireless internet throughout our property. We charge $15 per additional adult above double-occupancy. We consider children age 12 and over as adults. Rollaway Beds are available for $20 additional per night and foldable crib/playpen is available for toddlers at no additional cost. Special arrangements can be made at time of check-in and are subject to availability.